Just 11.5km north of Waitara, Onaero Bay Holiday Park is in a spectacular location, on both sides of the Onaero River and surrounded by native bush. It is a great outdoor environment, along with limited cellphone coverage, which means this is the ideal spot to get away from it all! Our quiet family camp has 70 level power sites and 50 tent sites scattered across well-manicured grounds. We have 1 family cabin (sleeps 4) and a standard 2-berth cabin. Communal toilets; showers; kitchens with fridge/freezers, ovens, hotplates, microwaves, toasters and kettles. Laundries with washing machines and dryers, coin operated. TV lounge with Freeview; internet kiosk; wifi; camp store; playground. Dump station. Accessible facilities available. Your Hosts: Anita Murphy & Brad Birss. 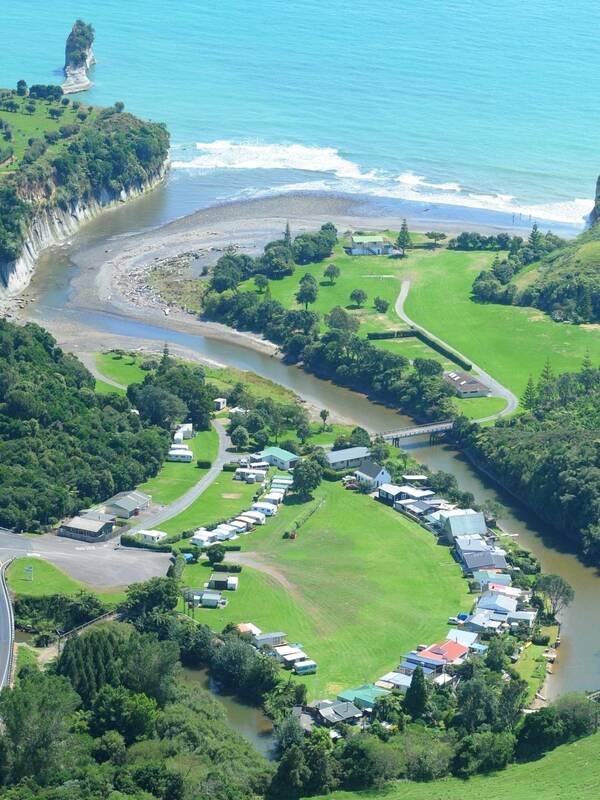 Just 11.5km north of Waitara, Onaero Bay Holiday Park is in a spectacular location, on both sides of the Onaero River and surrounded by native bush. . . . More . . .